One of the most commonly exploited loopholes in Atlanta's tree ordinance can be found in Section 158-101(c)(1) of the Atlanta Tree Protection Ordinance. This section says, in part: "Such [Dead, dying, diseased or hazardous tree] permits are not subject to the notice of preliminary approval of subsection 158-101(d), the posting requirements of subsection 158-101(e), the standards for tree replacement or afforestation of subsection 158-103(1), the recompense formulas of subsection 158-103(b), or to public appeal." In other words, if the city arborist says a tree is DDDH, no amount of evidence showing otherwise will permit you to appeal that decision. Nor will the owner of the property on which the DDDH tree(s) resides be required to replace or pay recompense on the tree(s). 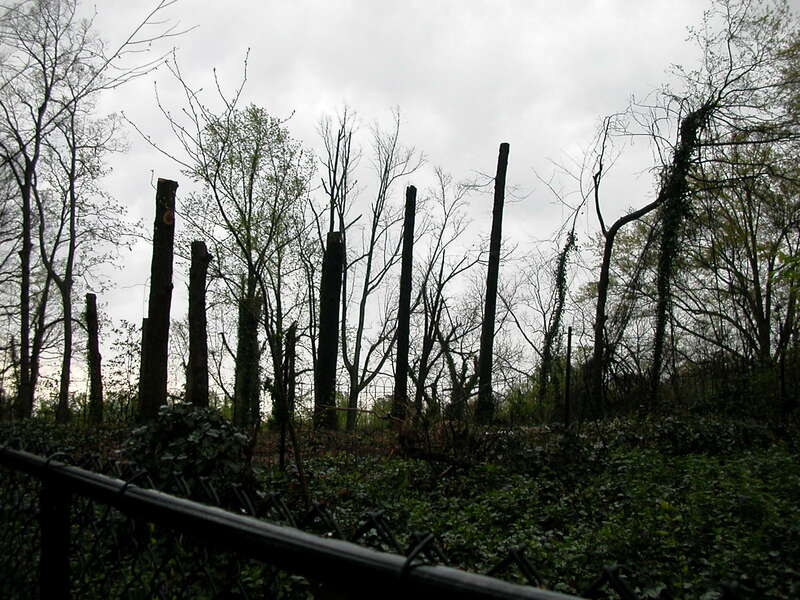 To the left is a picture of a decapitated stand of mature oak trees that used to shade the Virginia-Highland property from which this picture was taken. Upon learning that many of these trees had been declared DDDH by the city arborist, a nearby neighbor filed an appeal, stating that an independently hired arborist did not find any evidence that these trees were DDDH. The Tree Commission denied this citizen the right to appeal using Section 158-101 of the tree ordinance. The developer who subsequently built an infill home on this property was not assessed recompense on these destroyed trees since the city arborist had declared them DDDH. This "DDDH Loophole" has caused an incredible amount of frustration and heartache for Atlanta citizens who, after having lived next to a stand of healthy trees for decades, discover one day that all the trees have been deemed "DDDH" because they are in the way of a planned construction project. To avoid paying recompense on removed trees, builder/developers often hire their own arborist to submit a report to the Arborist Division identifying the trees the builder wants removed as "DDDH". The city arborist is then allowed to rubberstamp that report "as is", without verification, because there can be no appeal of the city arborist's decision. It doesn't take much stretch of the imagination to realize that when there is no way to challenge a city arborist's DDDH decision, it is much simpler for the city arborist to declare the trees as DDDH than to have to inspect the trees in person, write a report showing why the trees are not DDDH and then go head-to-head with the builder/developer and their arborist, challenging them as to why they are wrong. Until this specific section of the tree ordinance is changed to allow citizens the right to appeal a DDDH decision -- which would require the city arborist to show how he or she determined the trees are DDDH -- we can expect this loophole to significantly contribute to the diminishment of Atlanta's tree canopy.